Yes, Chuck. Just Philly and NYC. 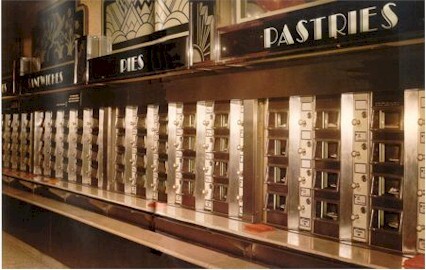 Were automats an east coast thing? Cuz I never saw 'em here in SoCal. I seem to recall Dennis James on T.V. calling these "Less work for mother retail shops." Put your coffee cup under the lion's head spout before you drop your coin or watch it be dispensed down the drain. 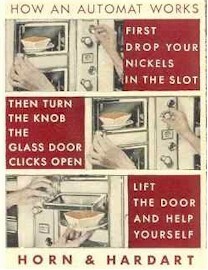 Before fast food, there was the automat and the luncheonette. My Dad brought me here for lunch whenever I came to the office with him. You needed lots and lots of nickels, which is all the machines took. It wasn't really so "automated" -- there were people behind the wall, putting items in the windows -- but it was a fun gimmick.